"Motocross: Chasing the Dream" is a motocross game set out to change the entire landscape of the current motocross racing game genre to encourage other studios to make their games more realistic and portray motocross the way it's supposed to be. Motocross: Chasing the Dream started out in late 2015 as a simple prototype just to see if it was possible to make a realistic-enough dirt bike work as intended. Shortly after, a group of veteran content creators from a game called "MX Simulator" was rounded up and now is the foundation of LCQ Studios; a remote indie team. Since then, MCTD has evolved into a game that has a lot of potential to live up to it's original goal of facilitating change within the motocross racing game genre while creating a fun, educational experience for the developers and a rich, authentic experience for future players. There are two main areas in which the game plans to excel at; a cinematic single player story mode and deep, competitive online racing. The single player story mode will show the experience of a young racer getting their first bike and battling their way up the ranks as they progress in age showcasing all of the hardships and successes of an amateur rider in the United States. The details of the story mode are still being written, but there will be three different classifications of the rider that are in line with the real life amateur scene. Players will start out on 50cc dirt bikes and will learn the basics of motocross and how to ride the bike. This learning experience progresses in difficulty and skill throughout the story as the player tries to make it to the bigger, faster 450cc bikes. The first classification will be "Privateer". This is for the players who do okay in races, but aren't doing great. They will have to pick and choose what parts to buy for their bike to upgrade and maintain it while also managing their money to be able to participate in the next race. This classification is where all players start and could stay throughout the whole story potentially. The second will be "Support Rider". This is for the good riders who place in the top ten consistently every weekend. They will receive support from factory companies who can supply things like parts for you bike as well as gear. Players will still be responsible for paying race entry fees and some bike parts. The last classification is "Full Factory Rider". Here the player will basically have everything given to them because they are the elite riders in their respective bike class. All the player will have to worry about here is finishing in the top 3 every race otherwise they could potentially lose their ride. Multiplayer will probably be our main attraction. Since most of the team has come from "MX Simulator", we are all very familiar with competitive simulation racing from leading hosting organizations like "Race Factory Gaming". Our online racing system is being designed around the real-life amateur racing scene to create the most authentic experience we can. We will have a licensing system that ranges from Pro to D class. A players classification will be based on an ELO system and work similarly to iRacing's implementation. Players will be able to form teams on our online service called "LCQ Hub" where they will be able to upload skins for their motorcycles that will be downloaded into a race for everyone to see. Players will have unique numbers on a first-come-first-server basis depending on their skill class until they get to the pro level where they will be racing for the lowest number. We are shooting for a sim-cade motorcycle experience. While most of our mechanics are built around arbitrary physics, we want to keep the game from feeling too much like an arcade game to enable pick-up-and-play but leave enough of a learning curve to let players try to master the game. Our physics feature a two-stick control scheme. One stick to control the bike such as steering and one to control the rider such as leaning and standing/sitting. We have implemented split or joint braking depending on the players preference. We are also working on a lot of physics customization features such as transmission gearing and suspension settings. 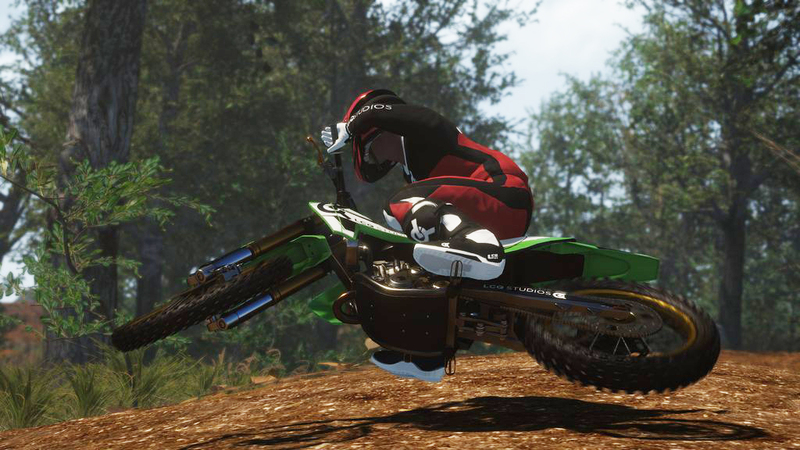 When a rider jumps the dirt bike, the in-air physics are free so the player can perform any kind of whip or scrub. For the first time in a modern motocross title, when the rider crashes they will have to get up and run/walk back to their bike and get on. There won't be any resets just like in real life. This is to promote cleaner, smarter racing in single player and more importantly in competitive online racing. A player cannot win races if they are on the ground all of the time. As mention previously there will be bike customization that affects the physics, but we are also working on a rich visual customization which tends to be a staple in most racing games. Dirt bikes have a lot of parts to customize in real life and we want to translate that into our game. At the core, we allow the player to change basically any color of any part besides the motor on the bike. Things like plastic colors, wheel colors, sprocket colors etc. We also supply a graphics cutout so the player can take it into a photo editing program like Photoshop or even Illustrator to make their bike stand out. We want the player to be able to show their uniqueness on the track. We don't have a lot done as of now, but we plan on making aftermarket parts for the players to upgrade their bike or just to make it look even more sweet than it already did. Similar to the bike models, the rider model will have lot's of gear to choose from like helmets, neck braces, boots, goggles, and suits. All of the colors will be customizable as well. All of our customization options are created using Substance tools so we can dynamically change colors and even material finishes. If you would like to demo a basic customization scenario, we have one available on our website under the downloads tab. We also have a full-featured track editor in the works. Currently, players are able to create terrains and modify them using the standard Unity terrain tools, but at runtime. we have support for custom, imported brushes, textures, and even models to spice up the environment. Of course, all of the assets we use to create terrains like textures and models will be able to be used to right in the game itself. Players will be able to upload their track creations to our "LCQ Hub" and to Steam Workshop. We are making this game because we are passionate about motocross and love every aspect of it. While we can't please everyone, this project revolves around community feedback and we want to make sure that the majority of people who play motocross games are satisfied. We plan on doing big things! Although there are still a lot of this project under wraps we're excited to show more of it in the coming future. This page will continue to receive updates, but the best way to follow development is on our social media or on our forums. We have a very active community and would love for you to check it out if you're at all interested in this project! !Our website is going through a makeover right now so it's a little bare, but most of the information about the game is on our forums if you wish to see more.